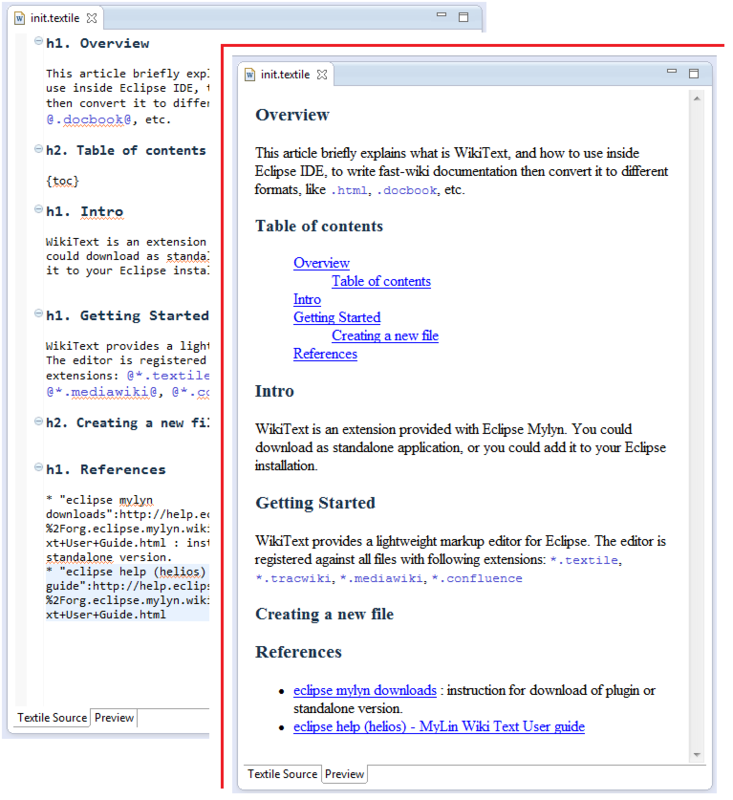 This article introduces WikiText and explain how to install it into your Eclipse IDE; how to write a brief document and how to transform a source document in HTML and DocBook formats. WikiText is an open source, lightweight Wiki editor; for writing offline documentation, with a multitude of wiki dialects. It has a WYSIWYG preview to see results; and can transform documents in several output formats, included html, docbook and EclipseHelp. WikiText is available both as Eclipse extension, provided with Mylyn project, and as a standalone distribution, including ANT tasks to automatize transformations. At the end of editing you could transform the wiki text into different formats, like *.html, *.docbook, *.eclipsehelp, etc.. In this article I show how to add WikiText as eclipse plugin, write a brief article and transform it into html and docbook. You can get WikiText in two ways: install as eclipse plugin, or getting the standalone distribution. to Install Mylyn WikiText into Eclipse Juno Platform, start from menu: Help > Install New Software.. , and the Available Software wizard starts. In the wizard select the Juno update site ; type “myl” to filter results, and install those two (Mylyn) components components (look at the image below). Once downloaded unpack it then extract into a folder, in which you could find documentation and needed jar for execution. To start using WikiText, just create a new file, with one of the handled extensions: *.textile, *.tracwiki, *.mediawiki, *.confluence . For this instance I would like to create a basic *.textile file, whose content is visible in figure (or available for download). Inside Eclipse you can produce html or docbook output documents. To convert select the input document, right-click on it then select WikiText > Generate ..
eclipse mylyn downloads : instruction for download of plugin or standalone version.